I thought I might start a thread which showcases the graphics abilities of R. I'll start it off with one I just made. 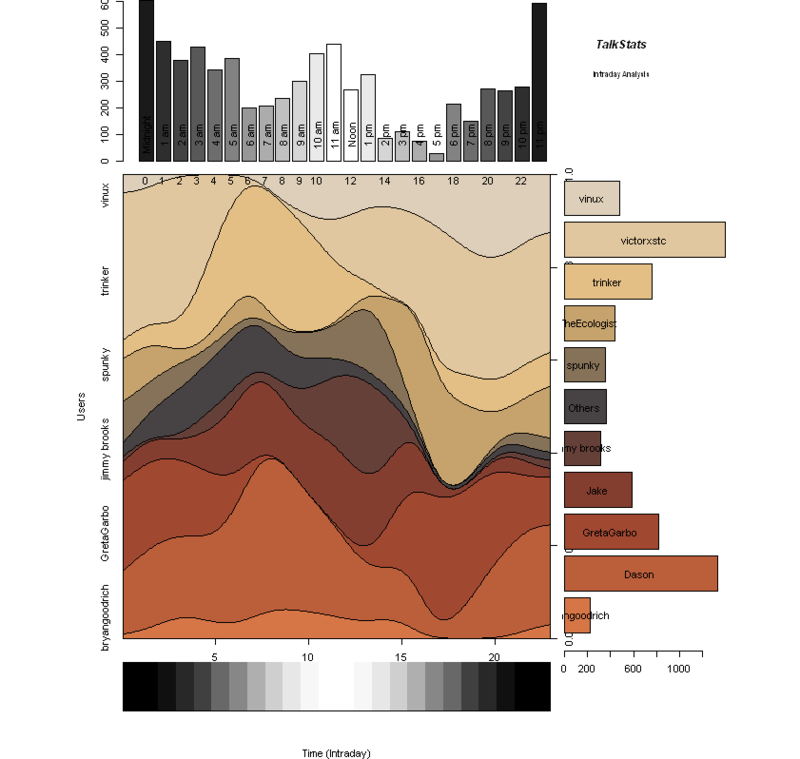 This thread was also inspired by bg and trinker claiming that this could never be done in R.
Of course it can you just won't be able 1) to showcase it in R but it works nice with any non IE browser or 2) do it in ggplot. This is SVG, and its enormously powerful! To make graphs like the above and the below, you need to get down and dirty with all the functions at the base of ggplot and beyond (head over to the "darkside"). 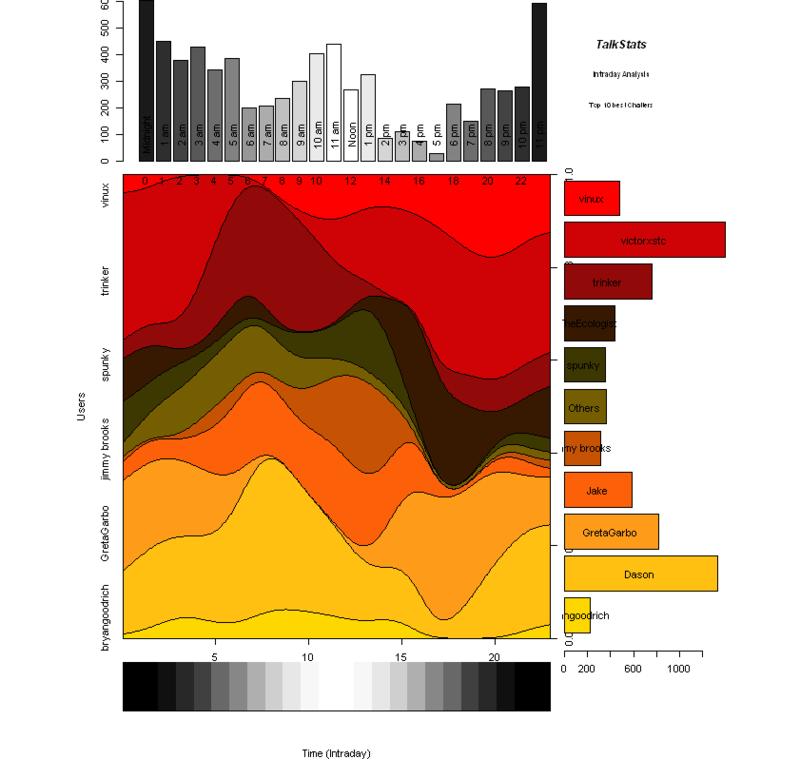 So I'll start off with this example, I was inspired to improve on it after I saw someone's attempt to do it in ggplot. Hopefully this hits off and we can share some amazing graphics and code with each other. My next goal will be do show how you can do this in R.
Looking forward to seeing your contributions. 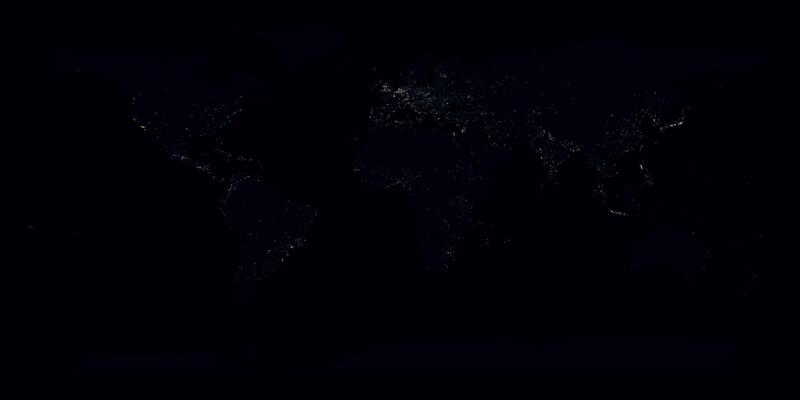 THE ENTIRE WORLD HAS GONE DARK! THE SUN IS DEAD! WE SURELY WILL NOT SURVIVE. Here is one on TS chat data. There is nothing new in graphical side. Here is the chat summary (I have removed the chat contents for confidential reason) Dataset. It is an intraday analysis of chat data. I have taken IST as the reference. I thought of adding one more scale. But I don't wanted to confuse with day light saving system. Some of the US folks they just need to change am to pm and pm to am. Here you can find the code. ts <- read.csv(insert_url_for_dropbox_csv_here) # Send a message if you need to know what the file is. I tried to automate the color from the chat. I will try this next time. Now some findings. You can identify the sleeping/working time. What I can observe is all humans sleep at least 2-3 hours. Rest is left to you. @vinux, does your code need a require(chron)? - Oh and great graphic! @vinux, does your code need a require(chron)? Unfortunately yes. I thought of removing that. My stupidity. I could have used ts$dttime$hour. EDIT: I have removed chron function now. It is purely a base R example. What do you think Vinux? It would be interesting to incorporate or consider the inter-relationship between chatters. Obviously some individuals co-mingle more and the chat is more lively at certain times. Is the time based on the international date line and medians over a week? Again, thanks for the wonderful graphic vinux! Here is first level of inter-relationship between chatters. You can ignore the diagonal part. Black shows the positive association. You can see the clusters. Victor-greta, trinker-Dason, VInux-TE, jake-Dason. Dason is positively associated with most of the users. One could also try mosaicplot. To some extend this reveals where we live. People in the states have similar shapes where as people on the other side of the world have the opposite shapes. Lovin' this thread. gotta tear this association plot apart. I'm wondering if the association is based on proximity or mention of someone's name (ie @vinux) but haven't run the code. Also, from the chatbox statistics, I think we can say that Greta and Victor are very likely to be starting up a relationship (p<0.0001). Done (on condition everyone else agrees). I wanted to point out the talk stats library I bundled up using Dason and bryangoodrich's collective genius that downloads the chat box. We were looking at association of chatters. I'm working on an average distance measure function in R that goes with the visual representation as a gantt plot as seen below. Too big to display. -click here- instead. The level of detail in the pdf is well worth it. png tends to lose some smaller time durations. The next step for this is to finish working on the distance function by first properly using the math annotation to describe what's going on and also use with outer and Vectorize to produce a distance matrix of average distances between users. If anyone wants to help here's that thread (LINK). Would you mind explaining those plots? My apologies I thought they were self explanatory probably because I've been working with them so much lately. I was hoping they were because that's the mark of a good plot. Think of the y axis as time (unit of measure though is words). Where you have a color strip you were conversing in the chat box. In the unfaceted plots we have time (days) as one big continuum from left to right. In the faceted I broke up the days. I could have gotten fancier with plotting the background colors by day but was lazy. To some extent then we can assume that people clustered in close proximity to each other were more conversant with on another. This distance measure I'm working on may capture this even better. EDIT: I just realized that the xlab is set to a funky default. I changed that behavior but don't feel like fixing the graphics (lazy).